Louisiana ranks second among the 50 states in petroleum refining capacity. Louisiana uses 18 refineries to handle over 3.0 million barrels of crude oil per day. 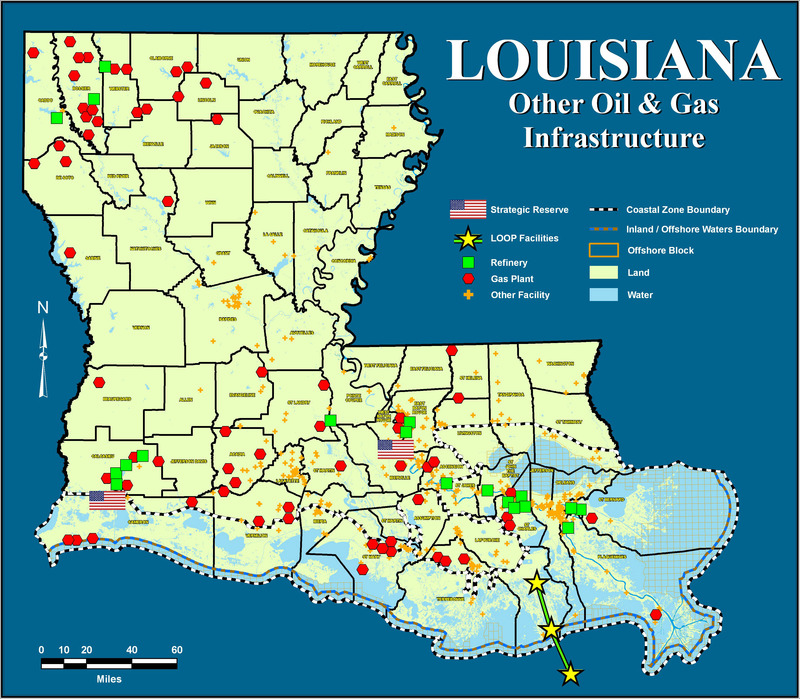 At its peak, the state had more than 30 refineries operating in Louisiana. Operating refineries in Louisiana account for 18% of the nation’s refining capacity. ExxonMobil’s refinery located in Baton Rouge, Louisiana is the fourth largest refinery in the United States. Marathon’s refinery located in Garyville, Louisiana is the third largest in the United States. Louisiana’s refineries serve the states of Louisiana, Texas, Mississippi, Illinois and the eastern seaboard. *The final total product of a refined barrel of crude oil may exceed 1 barrel, since some of the lighter liquids are in a near gaseous state and accordingly take up more volume. This list is only a sampling of the products made from crude oil. It is not intended to be all-inclusive. It is meant to show in just how many areas products made from crude oil are found and used. The pipeline industry is a vital part of the oil and gas industry in Louisiana. Louisiana has an extensive pipeline network with thousands of miles of pipeline in the state, serving all facets of the industry as well as consumers. Louisiana pipelines safely transport crude oil from the Gulf of Mexico to refineries in Louisiana and other states as well as carry natural gas to all parts of the country. Pipelines transport natural gas from producing states such as Louisiana to utility companies, chemical companies and other users throughout the nation. Pipelines are also used to transport refined petroleum products such as gasoline and diesel from refineries in Louisiana and other states to markets all over the country. There is a total of approximately 125,000 miles of pipelines moving through Louisiana. There is an estimated 87,764 miles of pipelines onshore Louisiana and 37,000 miles of pipelines in Louisiana OCS waters. There are thousands of miles of flow lines and gathering lines moving oil and gas from the wellhead to separating facilities while other pipelines transport chemical products with no petroleum base. The total assessed value of the pipelines in Louisiana is over $1.9 Billion, according to the Louisiana Tax Commission’s 2011 Annual Report. Louisiana is home to the world's only offshore superport, Louisiana Offshore Oil Port (LOOP), which allows supertankers to unload crude oil away from shore so that it can be transported via pipeline to onshore terminals. LOOP is the only port in the U.S. capable of accommodating deepdraft tankers. The Henry Hub in Louisiana is a hub of natural gas pipelines in Erath, Louisiana that serves as the pricing point for natural gas futures trading in the United States. Cheniere’s Sabine Pass LNG (liquefied natural gas) import terminal is the largest of nine existing LNG import sites in the United States. Marketing is the wholesale and retail distribution, including tanker truck transportation, of refined petroleum products such as gasoline and diesel fuel to business, industry, government and public consumers. Approximately 2 billion gallons of gasoline are consumed in Louisiana, with most of it being purchased at gasoline stations located in virtually every community of the state. What we pay for in a regular gallon of gasoline? The federal tax on gasoline is 18.4 cents per gallon. The American Petroleum Institute (API) collects motor fuel tax information for all 50 states and compiles a quarterly report and chart detailing changes and calculating a nationwide average.